Every home theater or music system requires a quality subwoofer to deliver its best performance. After all, it’s the subwoofer’s which produces the low-frequency sounds and gives you the deep bass that you crave. Without a subwoofer, you are missing out on all the exciting sound effects that modern technology has brought to our movies and music. Now, the good news is that there is no dearth of subwoofers in the market. The bad news is that it’s not easy to find a subwoofer that meets all of your demands. Not by a long shot. The JBL Arena S10, however, can spell the end of your search for a quality speaker. But is it really the solution to your problem? That’s for you to decide, but after reading my review. JBL is a well-known name to the audiophiles and comes with a marvellous reputation for producing high-quality subwoofers at a reasonable price. 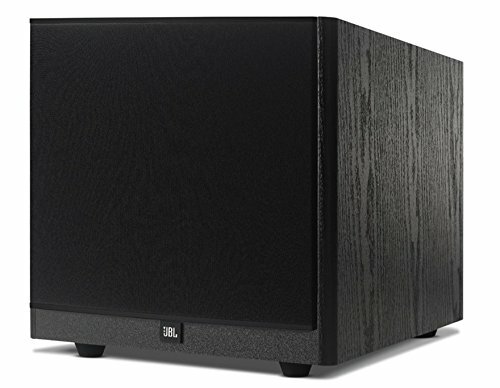 Their latest offering; the JBL Arena S10 is a powered home subwoofer and has been designed to work with the entire series of JBL Arena loudspeakers. And yes, it’s perfectly able to produce chest thumping bass with the help of its polycellulose woofer. The Arena S10 provides 100 watts of continuous power and 200 watts dynamic and allows you to feel the subtle sound effects. It has an adjustable crossover which ranges from 50 Hz-150 Hz (variable) and a frequency response of 41 Hz – 150 Hz. Moreover, the dual rear ports reduce distortion considerably and render loud and clear sound. The Arena S10 has been compactly designed and has a small footprint. Therefore, you could fit this device easily in a small room without sacrificing a lot of space. Due to its contemporary cabinet shape and black grills, it has an impressive design and looks elegant. It is available in both black and white finishes, therefore, making it easier for you to match your current home decor. The dual rear ports of the subwoofer make the most effective use of airflow and in turns reduce port turbulence and reduce distortion significantly. The Arena S10 has an adjustable crossover and phase controls to ensure smooth blending with your speakers. The adjustable crossover and phase control setting will allow you to optimize the sound of the subwoofer based on your preferences or environment. The crossover frequencies of the subwoofer are 50Hz – 150Hz (variable). The frequency response of this subwoofer is 41 Hz – 150 Hz and is able to handle a wide variety of sounds. However, With 41 Hz as its low-frequency response, it often fails to cope with the lowest booming sound effects. Although there’s not a lot of content that is below 41 Hz, when it comes to playing those ultra-low-frequency sounds, it can sometimes produce port noise and loose bass response. The subwoofer comes with a 10″ polycellulose woofer. Although polycellulose woofer isn’t very common, it’s quite effective. The rear panel with connectors and controls is sturdily made and enables you to integrate the subwoofer into your music system seamlessly. In addition, it makes the setup process much easier and hassle-free. One of the amazing aspects of a powered subwoofer is that it contains a built-in amplifier. Hence, there’s no need for additional power or amp from the receiver. This device is a self-contained speaker unit, in which the features of the amplifier and subwoofer are matched perfectly. Therefore, you will get the best possible performance. Rear mounted control makes the setup process simple and straightforward. 1. Is it possible to use my phone with the unit? Unfortunately, this device isn’t Bluetooth enabled. Therefore, you can’t use your phone with the device. 2. Is this subwoofer the same as the JBL Arena sub 100p? Principally it’s the same device. They have just changed the model number. However, the newer one sounds better. 3. Do I need to buy an amplifier for this device? No, you don’t. You just need a signal, which means you can connect this to any device via a simple headphone jack or AV receiver pre-out. 4. What is the impedance rate of this device? Actually, there’s no impedance in this subwoofer. It has, however, a powered sub preamp and crossover. 5. What kind of cable connection do you need for this device? You would need to buy an RCA connection cable for this device. 6. Can I use this subwoofer for karaoke? Well, it depends. You can certainly use this device with a speaker. However, you can’t use this as a substitute for a speaker as it only improves the bass in the speaker and surely not suitable for music. 7. Will this device bring fullness to my music experience? Rest assured that this device will certainly improve your audio experience. Moreover, you can change the frequency response on the back of the unit. 8. What are the dimensions of the cabinet? The device is 14.5″ wide, 14.5″ high, and 17″ deep. The JBL Arena S10 will be a good addition to any sound system and will significantly improve your audio experience. Although some high-end features have been incorporated into the device, the subwoofer comes at a relatively low price. This subwoofer is perfectly suitable for a small to a medium-sized room; however, it might struggle to deliver top-notch performance in the large-sized room. If you have any further question regarding subwoofer, please leave a comment in the comments section. Happy shopping!